The following is a list of slide shows and book signings – some alterations may still be made. I will be visiting Sunshine Coast, Vancouver and Gabriola Islands, Lower Mainland, Okanagan, and the Cariboo. Please be aware that I will not be able to process plastic payment on my tour; sales will be cash only. For receiving books by post office mail, please see this link. Madeira Park, Earth Fair Store, Oct 3, #3 – 12887, Madeira Park Rd, 10-11:AM, Book signing. Powell River Public Library, Oct 3, #1– – 6975 Alberni St, 7.00:PM Slide show. Nanaimo Harbourfront Library, Oct 4 (might be Oct 5), 90 Commercial St, 6.30:PM, Slide show. Duncan Library, Oct 10, 2687 James Street, 6.30:PM. Slide show. Pemberton Library, Oct 13, 7390A Cottonwood St, 7.00:PM, Slide show. McGill Branch, Burnaby Public Library, Oct 17, 4595 Albert St, 7.00:PM. Slide show. Cloverdale Library, Oct 18, 5642, 176A Street, Surrey, 7.00:PM, Slide show. Ladner, Black Bond Books, Oct 21, Trenant Park Square, 5251 Ladner Trunk Road, 1-3.00:PM. Book signing. Kelowna West Bank Library, Oct 23, Westridge Mall #31, 2484 Main St, 2.00:PM, Slide show. Vernon (Greater) Museum, Oct 25, Not quite sure of the location yet. 7.00:PM Slide show. Revelstoke Library, Oct 26. 605 Campbell Ave, 7,00:PM. Slide show. Blind Bay Library Oct 27, #3, 2425 Golf Course Drive, Blind Bay Market, 1.00:PM. Slide show. Salmon Arm Library, Oct 28, 285 Piccadilly Mall, 1151 10th Ave SW, 2.00:PM. Slide show. Williams Lake Library. Nov 2. Suite A 180 North 3rd Ave. Not sure if it will be afternoon or evening yet. Slide show. Just want to say again how much John and I enjoyed hearing you speak last night. Your books have always fascinated, but to finally hear you in person telling your stories was amazing. Have been unable to put down the newly purchased book today…a luxury I finally truly appreciate after hearing about what you must accomplish in a day. Keep writing – and look after your knees! Thank you Chris, your book arrived autographed and with a Happy Birthday as well on Oct.3 exactly one month before my birthday. I’ve perused it, read bits and am now into it. Here I am a real ‘people person’ but I love your books and the fact that you are such a loner. I’ve always enjoyed these type of books and have read others from around BC. as well. I guess opposites attract. Hope you are enjoying your tour and selling lots. Could you send me the total cost including postage and I will send a cheque. If you have a better way for me to purchase the book just let me know. All the best on your tour. I have sent notes to a couple of people in Kamloops. Lonesome Memoirs of a Wilderness Dog was the first book I read. After that I was hooked and have bought and read a number of your books. My family doesn’t always appreciate it when I read one of your books from cover to cover. What can I say some books are hard to put down. Your lifestyle is a dream for many of us, it’s wonderful to read about your courage in turning your dreams into reality. I just finished reading your book: Wildfire in the wilderness and I could not put it down. From 1996 to 2002 I have lived a similar lifestyle but not nearly as difficult as yours since we were much closer to the road and I wasn’t alone. For health reasons we had to move to a place with easier access to a road. I am so delighted that you have included 100 Mile House in your Book Tour and I was wondering if you will bring books with you for the public to buy? 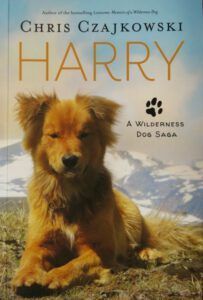 I cannot wait until October, so I am going to buy Lonesome, Memoirs of a wilderness dog now. Wildfire in the wilderness, you mention that you have a written a book on wildflowers. what is the title and can I purchase it? Thank you so much for your delightful stories! So happy to hear you are doing a fall book tour, but sorry you are not coming to the Island. Where can I get your new book? I have your books out on loan all the time, you have many fans! My brother in law is fascinated with your live story and is planning a trip. Missed meeting you when we were at Tatla Lake in June. Are you interested in fitting in an afternoon with Mill Bay/ Duncan writers and/or readers before your Nanaimo slide show? I could pass on any info to possible organizers at Arbutus Ridge or local libraries. I heard you are working on a flower book. I love your photos of the wildflowers in your area. We met Jeanie Fell and were delighted to spot both death camus and spotted coralroot (one of each!) while looking at her garden. She had only good things to say about you, as did Lori King. New blog looks and certainly does load more easily, (especially for those of us on slow funky internet systems). But I DO miss seeing your beautiful dog’s face watching over the site! Wishing you a great summer, with good food growing. The Prince George date has dropped off your itinerary, does that mean William’s Lake is the furthest north you will be travelling?